Senior Trump administration officials are working to contain the fallout after President Trump said he wanted American troops in Iraq to “watch Iran,” in a Sunday interview that some Baghdad watchers say could imperil the U.S. military presence there. On Tuesday, the top general in the Middle East, Gen. Joseph Votel, sought to downplay the president’s remarks, insisting to the Senate Armed Services Committee that the military mission in Iraq remains focused on the defeat of ISIS. “The U.S. is a major power, but do not pursue your own policy priorities. We live here,” he said. But in fact, the United States may be at risk of losing even its current presence in Iraq. The combination of those two affronts — the CBS interview and the base visit — have made it harder for U.S. allies in Iraq to push back on the pressure they’re getting from the bloc who want to see troops gone, said Michael Knights, a senior fellow at The Washington Institute who specializes in the military and security affairs of Iraq. Senior leaders and politicians across the Iraqi government are debating how to handle the matter now, Knights said, noting that there is a recognition in Iraq that if the United States is forced to leave, it will likely carry the other countries in the global counter-ISIS coalition with it. The issue was likely to come to a boil even without Trump’s remarks, thanks in part to the success of Iran-backed militias in May — but it could have more smoothly been handled in an agreement between the two governments at the cabinet level, Knights said. “I worry that the president is thinking about military action against Iran as something that would be a good idea,” Sen. Tim Kaine, D-Va., told Votel Tuesday, after pressing him on whether the mission in Iraq had changed from countering ISIS to countering Iran. 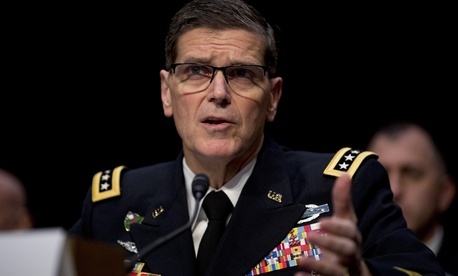 Votel said that it had not, and that he believed that if the mission were to shift, it would require the United States to obtain permission from the Iraqi government. A senior administration official who briefed reporters before a meeting of the 79 countries in the counter-ISIS coalition in Washington this week also insisted that the U.S. military mission in Iraq remains focused on the Islamic State. “Our troops are in Iraq to ensure the enduring defeat of ISIS,” the official said.